If I could live in one outfit this season, it would without a doubt be with one. Which is super surprising, even to myself, since there's not one piece that's blush pink. However, I LOVE this oversized trench paired with a chic white blouse. There's something about it that's just so functional, yet stylish all in one ensemble. Next time I wear this look, I'm going to add a pop of leopard and booties! I love the jacket but especially can't get enough of the shoes! Your shoes .... show stoppers! I wish they were still available! I love how you pulled the look together! That trench coat looks great on you! You hair and makeup looks gorgeous too, as always! Love the color of the trench! Such an amazing fall color. I am also loving your ZAC by Zac Posen bag! Gorgeous trench! I love the color. That trench is to die for! Gorgeous. 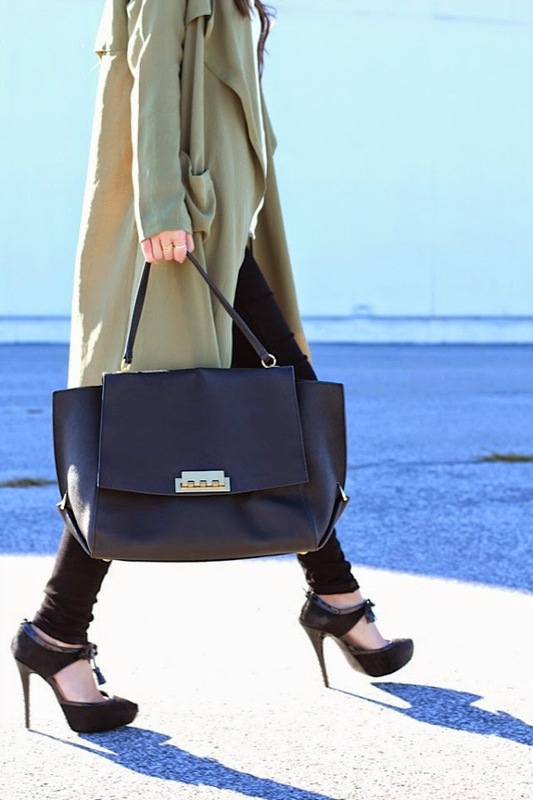 A good trench coat is a necessity and this one is great. I'm especially loving your earrings though! That trench is amazing! You look so stylish!